(That would be Dorie Greenspan, not Alan.) At my house, typical cornbread is a straight-cornmeal, skillet-baked, salty, and porky. Crumbly, crunchy, good for buttering and toasting, or eating with beans and rice, it’s definitely not sweet or cakelike. Enter the dilemma: my better half was raised on Jiffy (shudder) and those poofy-soft cornbread “cake” squares served in cafeterias and in soul food joints. Oh, he’ll eat a slice of my old-fashioned cornbread just to be nice, but he definitely won’t go back for seconds. Leave it to kitchen wizard Dorie Greenspan to craft a corn muffin that makes us both happy. Her “Corniest Corn Muffins” (p 4, Baking From My Home to Yours), combine half stone-ground cornmeal with wheat flour, a bit of sugar, a hit of freshly ground nutmeg, and an entire cup of whole kernel corn. Crisp on the outside, tender and sweet on the inside, the muffin is equally good at breakfast or dinner. I’ve been eating them split and toasted, spread with D’arbo apricot jam or fig preserves. See Dorie’s original recipe over at Serious Eats. I substituted white whole wheat flour for half of the all-purpose flour specified in the original recipe, and I used still-frozen corn kernels with great results. 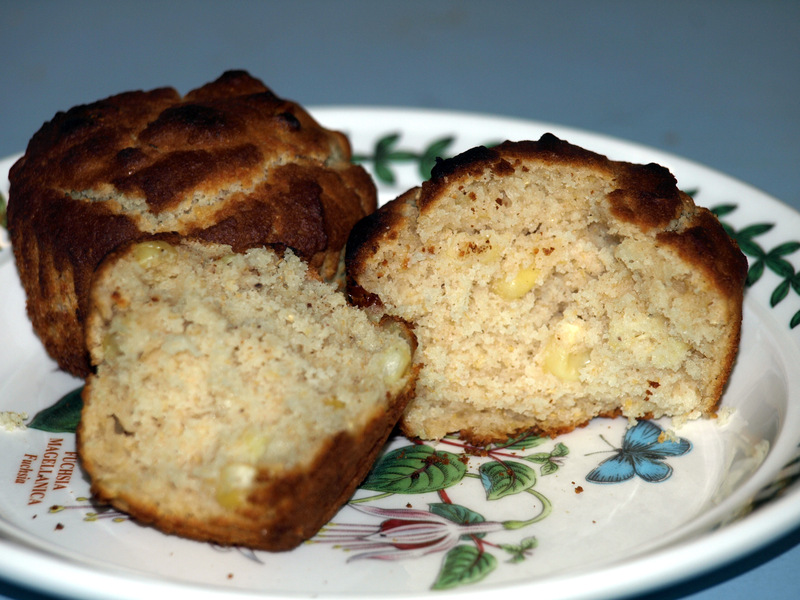 I also used white cornmeal and white corn kernels, so the muffins were on the pale side. Next time I bake the muffins, I’ll probably use less sugar.